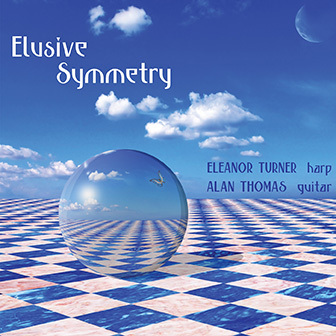 Elusive Symmetry is the result of a collaboration betweeen harpist Eleanor Turner and Alan Thomas. The music on the album was inspired by the work of the Dutch graphic artist M.C. Escher (1898-1972), and was written to be performed live as part of a multimedia show created by Eleanor Turner, Alan Thomas and the hip-hop dancer Lizzie Gough in 2012. Escher’s work offers plentiful inspiration for musicians, based as it is around pattern, process, symmetry, reflection and transformation. In a sense, the work presented here represents the mirror image of the goal embodied in the quote above—how to transpose into musical form the discoveries that Escher made in the visual realm. While some of the pieces offer more or less programmatic pictures of Escher's quirky imaginary creatures, others take a more abstract approach to treating musical material in a way similar to Escher's treatment of visual material—seeking musical analogues of the elusive symmetries which so delighted him in the graphic arts. Although Eleanor Turner and Alan Thomas are both classically trained musicians, they are also very interested in exploring new ways in which the classical style can interact with other musical influences. Hence on this disc you will hear elements of jazz, pop and electronica alongside Romantic and modern classical approaches. A key tool in exploring this interaction is the computer, which forms the third part in what is essentially a trio performance of harp, guitar and computer. Rather than a sort of karaoke scenario in which the live instrumentalists simply play along to backing tracks, the goal was to create music that enables flexibility and interaction between the performers and the computer. While in some cases the computer does indeed play back pre-recorded drum or synthesiser parts, in others it modifies or responds to the material played by the live performers in more or less predictable ways, leaving the performers the space and freedom to shape the music and interact with each other and the computer. Maurits Comelis Escher is one of the world's most famous artists, whose incredible works of ‘impossible structures‘ are instantly recognisable. The music on this fascinating new CD was inspired by some of his pictures and bearing in mind the quirkiness of Escher's material, the Turner/Thomas harp and guitar duo have been very successful in their attempt to capture in music what he put down on canvas. Every track but one makes use of a computer processing part, which takes the harp and guitar onto a different plane from what one expects from this pairing of instruments. The computer ‘part’ is far from being just used as a backing vehicle, this has a much more important role to play than that and adds depth and character to many of the pieces; the duo also makes use of a loop track, drum machine and string quartet. The music itself is most alluring, appealing and interesting and it is this last quality which raises the attractiveness of this disc from many others I have recently come across. Some of the compositions are quite surreal and impressionistic while others are just simply, beautiful.